Delhi, India is endowed with several popular monuments as a testimony to its rich history and I had spent days absorbed by the rich architectures of British, Mughal and Sultanate. During my last trip, I was curious to visit an offbeat place in Delhi instead of the usual tourist attractions. 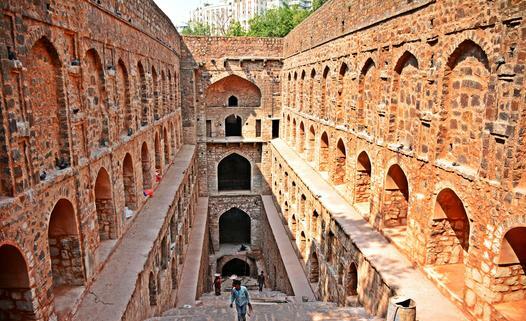 I started doing my research and I came across this place – Agrasen Ki Baoli(or Agrasen’s stepwell in English), an historical stepwell which traces its roots to Mahabarata, the hindu epic. Agrasen or Maharaja Agrasena is the legendary king, who lived during the era of Mahabarata (roughly about 5000 years ago or 3000 BC) and a contemporary to Lord Krishna. It is believed that the famous Indian trading community of Agarwals descended from him. 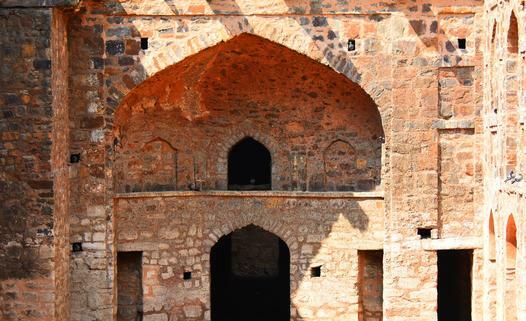 It is believed that Agrasen constructed the stepwell though the current one was rebuilt in the 14th century, probably by the Agarwal community during the Tughlak sultanate period. Though there were other stepwells, I was intrigued by the history and decided to visit it. This hidden treasure is located in Hailey Road near Connaught place in the proximity of Jantar Mantar. The entry is free. The stepwell itself is a 180 feet by 45 feet well surrounded by 3 stories of superimposed arches connected to columns, which is reflective of the Islamic architecture, in turn inspired by the Roman architecture. These arches itself are made up of redstones. There are 104 steps to the well. The place was eerily quiet, though workers under the auspice of Archaeological Survey of India(ASI) was working on renovations. The eeriness reminded me of the legend prevailing about the supernatural entity there. There is a belief that at one point of time the well was filled with black waters and would call out to disheartened people and hypnotize them to jump into the well and give away their souls. Once I got into the bottom of the stepwell, the echoing of the cooing of the pigeons and the sound of the bats only reinforced the legend. As I walked out, I entered into a conversation with a worker, who mentioned that they do not venture nearby after darkness as the story goes that the supernatural entity is nothing but the soul of a beautiful girl, who jumped into the well after being chased by a bunch of marauding Sultan’s soldiers. This hidden gem with its historical significance and I suggest travelers to pay a visit.